The Three Speed Personal Activity Vehicle Trike for adults - It's Unique! The Personal Activity Vehicle is an ergonomic marvel! Designed to be the world's most comfortable trike, the Adult Sport Trike incorporates contemporary style with classic proven features. 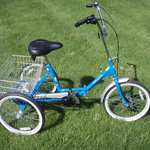 The Adult Sport Trike is available in a three speed model in either red or blue. 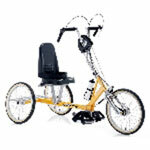 Its semi-recumbent design allows you to sit back, have fun and get great exercise at the same time! With its fully adjustable, richly padded, high back seat with arm rests, the Adult Sport Trike is like a couch on wheels. The Adult Sport Trike is very comfortable; the seats are larger than normal bike seats and you actually sit in the seat. You aren't perched on top of a narrow saddle which can tend to cause numbness and chafing. Your back will be supported while you ride! And padded swing down armrests to boot! The handlebars are above the seat at shoulder level where your arms hang down naturally. This combination creates a comfortable ride, making even long distance riding free from neck strain, saddle sores, and wrist pain. Riding is easier because when you lean back into the seat you use your legs, back and stomach muscles together. Because of the tricycle design, you will not need to disengage your feet from the pedals when stopped. Trikes are capable of turning sharply without leaning. 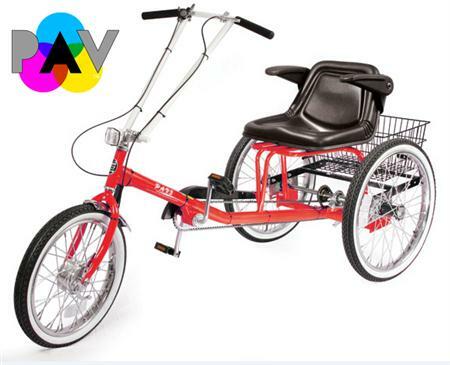 The Adult Sport Trike will be more suitable for people with balance or limb disabilities. For anyone even a bit concerned about their balance (which keeps a lot of boomers and elders from riding bikes), this is the answer. Three speeds - Yes, the three speeds allow you to choose a gear that is the most comfortable with your riding style . Outstanding stability - the Adult Sport Trike is amazingly stable due to clever weight distribution. Rider weight capacity up to 550 lbs. Ships 90% assembled via truck. Your PAV3 will be created just for you - please allow 30-45 days for delivery. Historical Note: Records of recumbent designs go back to the early days of cycling, however recumbent use was not widespread until the late 20th century. Recumbent riders hold world speed records for unpaced, human-powered vehicles. Tricycles form a substantial part of the recumbent market (far more so than they do for uprights); the generic term "bike" tends to be applied to these as well. Will hold a rider up to a weight capacity of 550 lbs. Overall width: 33.25" Overall length : 74"
Seat height from ground - 24.25"
For riders taller than 5'9" or riders with an inseam over 31", or riders whose weight exceeds 350 pounds, the "Stretch Frame" option is recommended. PLEASE NOTE: THE Adult Sport Trike SHIPS BY TRUCK LINE ONLY, EXPEDITED SHIPPING IS NOT AVAILABLE! SHIPPING IS AVAILABLE IN THE CONTINENTAL US ONLY. Please call for availability 1-888-833-8875. Please note: This is an individually manufactured item and is non-returnable. Please shop carefully. PLEASE NOTE: This product is made to order. Due to the high number of orders our manufacturer has placed a 30 day lead time on each order. Please call for availability 1-888-833-8875.